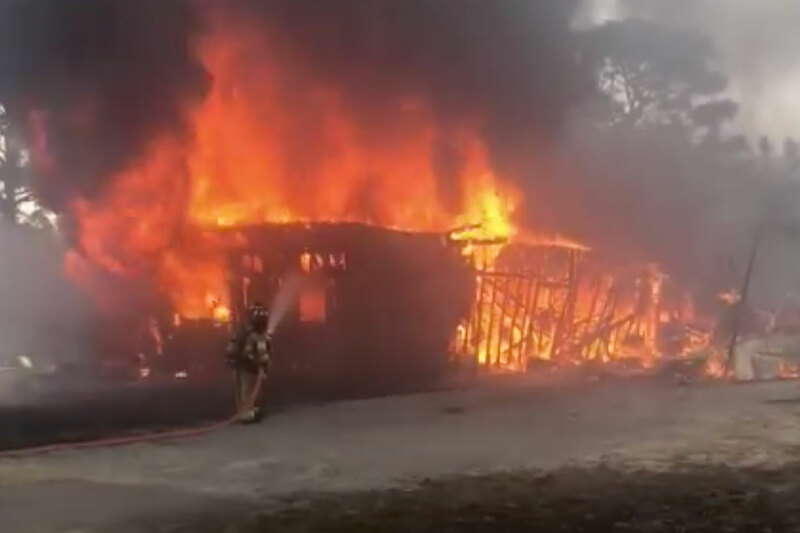 A large shop on Galaxy Drive in Crestview, FL has been completely destroyed by fire, possibly caused by an active fire pit only a few feet upwind of the shop. Area Fire Departments arrived quickly and contained the fire despite heavy winds and nearby brush igniting. Multiple agencies involved including Crestview Fire Department Engine 4, North Okaloosa Fire District Engine 85, Dorcas Fire Department, and Okaloosa County EMS. The good news is that no injuries were reported and only minor damage to the nearby main residence. Moderate rain assisted with final extinguishment. 5487 Galaxy Drive CrestviewLarge shop completely destroyed by fire, possibly caused by an active fire pit only a few feet upwind of the shop. Kudos to area Fire Departments who arrived quickly and contained the fire despite heavy winds and nearby brush igniting. Multiple agencies involved including CFD Engine 4, NOFD Engine 85, Dorcas FD, and OCEMS. No injuries, minor damage to nearby main residence. Moderate rain assisted with final extinguishment. Thanks to Deputy Michael Esneul, who arrived on scene to assist if needed, for the video and info!